ISOMARK FOOTPRINT is a two part silicone compound supplied in ready-to-use twin pack cartridges.The compound is applied ready-mixed to the mark using a robust dispening system and cures quickly to form an accurate, flexible cast. 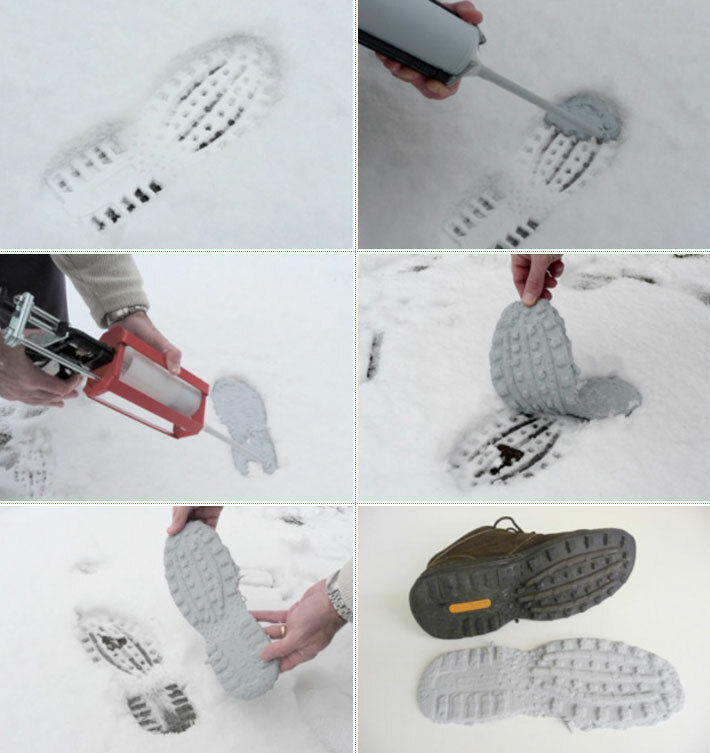 ISOMARK FOOTPRINT has been designed specifically for casting shoemarks in soil, sand etc. and can even be used in wet or very cold conditions. Typical curing times are between 3 and 10 minutes to a maximum of 20 minutes in freezing temperatures. ISOMARK FOOTPRINT provides a fast, clean cost effective approach to shoemark casting. When casting SNOW marks it is important to cool the cartridge down to the outside temperature before application to avoid melting the mark. At low and freezing temperatures the compound will take longer to cure.